Taking serious view of illegal activities, both in personal and political spheres, BSP supremo Mayawati dumped four MPs from the party. Three were found guilty in the cash-for-question scam while the fourth was found to have entered a polygamous relationship. The by-elections for the 10 parliamentary seats, which have become vacant following the expulsion of ten MPs in the cash-for-query scam, would be held soon after the revision of electoral rolls. Do airlines provide inadequate service when flights are delayed? With L.K. Advani on his way out, his opponents in the BJP are using the vast media contingent present to cover the party’s silver jubilee celebrations to take pot shots at him. Even as the Airports Authority of India today upgraded the landing system at Indira Gandhi international Airport to CAT-III-B from CAT-III-A to help pilots to land aircraft even in thick fog, the Ministry of Civil Aviation has stepped in to sort out the chaos created at the New Delhi airport following cancellation of flights, specially by low-cost airlines. Life was disrupted in Assam today following a 12-hour statewide bandh called in protest against the killing of three Bodo youths and alleged molestation of girls by Haryana police personnel. The surprise arrest of Mr Sudagar Singh, an employee posted in the judicial branch of the office of the Financial Commissioner (Revenue), by the Chandigarh Administration’s Vigilance Department has kicked off a controversy in the Punjab Government. 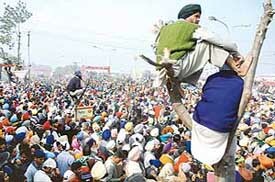 Devotees occupy every vantage point as they wait for Palki Sahib on the concluding day of the Shaheedi Jor Mela at Fatehgarh Sahib on Monday. The main Opposition party in Punjab, the Shiromani Akali Dal, today sounded the electoral bugle by announcing the party’s programme comprising a series of political conferences starting from January 2 next year. A comparatively peaceful state Madhya Pradesh seems to be the hot destination for Hindus in Pakistan to lead a respectable life. Dubai-based company, EMAAR MGF, which has already signed a Rs 5,000 crore memorandum of understanding with the Punjab Government to set up a world-class township at Mohali. It was a sombre day for the 99 tsunami orphans here today as they cried in the memory of their lost parents and siblings, exactly a year after the killer tidal wave wreaked havoc on the southern coastline of India. 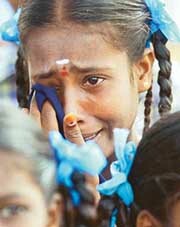 A survivor orphaned by the December 2004 tsunami in tears during a function organised to pay homage to the victims of the tragedy in Nagapattinam, 350 km South of Chennai, on Monday.